Price reduced for late registration. forms for the current session. What is League of Friends? 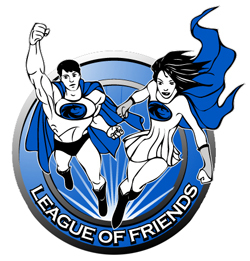 League of Friends is our program designed to increase the willingness, the interest, the desire to be social with others out in the community! LOF helps families and kids of all ages and skill level go out and have fun! For the child, LOF offers opportunities to socialize at varying locations that are typical outings, hangouts, and activities frequented by same age peers. Each League of Friends program utilizes a peer group approach where individuals are inclusively grouped together so all degrees of social adeptness are increased. Practice your social navigation skills without parents around but with the support of your peers and trained staff! There are no firm deadlines to enroll by as we want everyone to get up, get out, and meet and chat, and have fun! However, we recommend to gain the most from the LOF experience to join by the first event. Price will be reduced (pro-rated) for late registration. All new members must attend a new client screening/orientation and wait until the next upcoming event to start. Their enrollment forms and intake must be completed by the Sunday prior to the next event for them to start. To join you must have your enrollment forms into us by Sunday evening before the next event if you are a returning member. To enroll email us at info@unitedthroughhope.org or contact us at 1-866-857-7751 to gain the enrollment forms. see PDFs located on this page! Open to individuals enrolling in 3rd-5th!